What data are we extracting? Google Chrome Browser – You will need to download the Chrome browser. The extension requires Chrome 49+. Web Scraper Chrome Extension – The Web Scraper extension can be downloaded from the Chrome Web Store. After downloading the extension you will see a spider icon in your browser toolbar. Select the country (England) from this link. Click on your preferred league (Premier League). You will see an overview of all the teams. 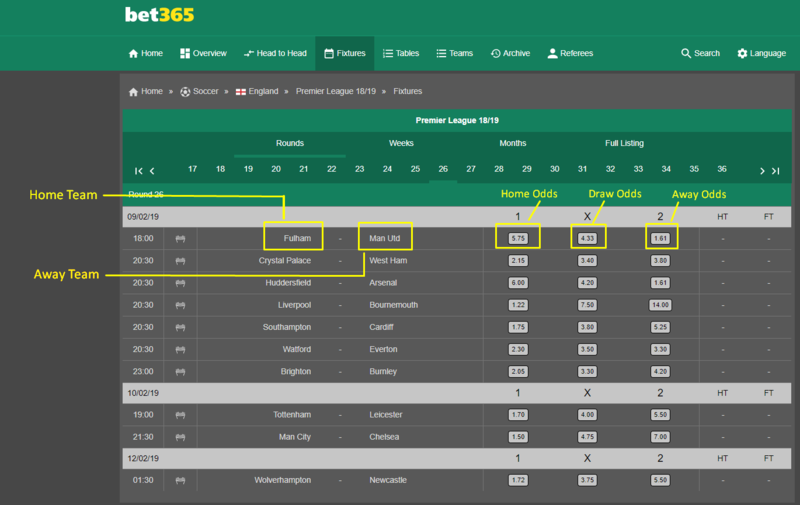 Click on the tab ‘Fixtures’ to view the odds data. Using the Web Scraper extension, you can create a sitemap that shows how the website should be traversed and what data should be extracted. The setup process is fairly simple, you can follow some of our other Web Scraper Extension tutorials or Documentation if you need to know more. We have already made a scraper you can copy paste into the extension. To start scraping, go to the Sitemap and click ‘Scrape’ from the drop down. A new instance of Chrome will launch, enabling the extension to scroll and grab the data. Once the scrape is complete, the browser will close automatically and send a notification. To download the scraped data as a CSV file that you can open in Microsoft Excel or Google Sheets, go to the Sitemap drop down > Export as CSV > Download Now. We have provided the tutorial for scraping data from soccer above. If you would like us to provide a tutorial for a sport you follow, please write a comment below. Disclaimer: Any code provided in our tutorials is for illustration and learning purposes only. We are not responsible for how it is used and assume no liability for any detrimental usage of the source code. The mere presence of this code on our site does not imply that we encourage scraping or scrape the websites referenced in the code and accompanying tutorial. The tutorials only help illustrate the technique of programming web scrapers for popular internet websites. We are not obligated to provide any support for the code, however, if you add your questions in the comments section, we may periodically address them. Step by step tutorial to extract historical tweet data from Twitter using Web Scraper Chrome Extension. Tutorial on how to scrape product details from best seller listings of Amazon using web scraper chrome extension. A quick and easy scraper you can import into your chrome browser. Just give it a URL and you should get all reviews.